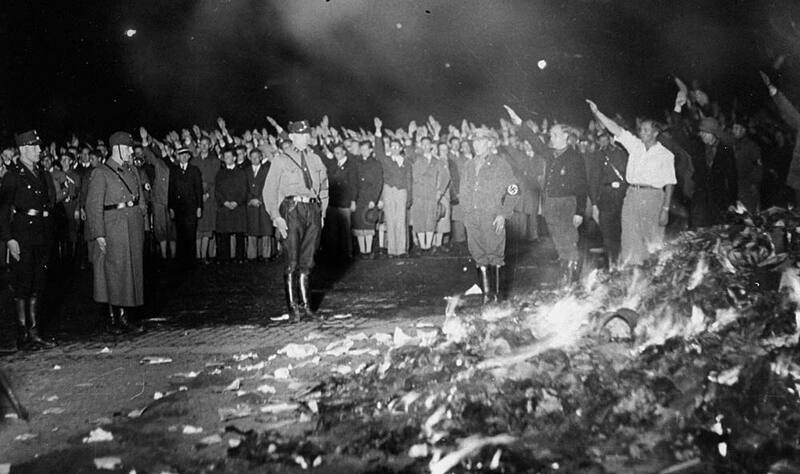 Nazis celebrated the burning of the books by authors deemed unfit by the state. World War II was far more than a clashing of tanks, planes, and artillery guns. It was a war of ideas, of worldviews. Nothing better captures the differences between the Nazi worldview and that of America than the way books were treated. The Nazis burned books while the Americans found ways to publish books that could be supplied to their troops. The Nazis burned books by the hundreds of thousands. They burned books authors they deemed unfit. The authors who were banned and burned ranged from Sigmund Freud to Hellen Keller. Other authors whose books were burned included Hemingway, Karl Marx, Heinrich Heine, H. G. Wells, C. G. Jung, Einstein, G. K. Chesterton, Jack London, Erich Maria Remarque (who wrote All Quiet on the Western Front), and Winston Churchill. Some were burned because of their political views; others because of Jewish heritage of the authors; and all that were burned contained something in the content that questioned what Hitler and the Nazis had determined was correct thinking. I would grant that there are authors whose writings are wrongful, twisted, and perverse. But it is often the prophets of the darkness who create the best contrast with the light. Men are created in the image of God and that is inescapeable in what is written. Even the worst of books and the most crooked ideas contain fragments of truth or insights into the human condition. In some cases, books reflect ideas that are important because of the role they played at some time in the present or the past. Freud’s works should not have been burned because of his influence on the 20th century and various fields of thought. Nor should the writings of Marx. I would object strongly even to Hitler’s book Mein Kamf being burned. It was bizarre that the country that was building huge bonfires with forbidden authors was also the country that had produced so many pivotal thinkers and influential universities. The world of Nazism was a world gone mad. Our current political correctness fads are child’s play compared to what the Nazis did to suppress ideas. It was a real example of what Orwell feared in 1984 and what Bradbury described in Farenheit 451. In a really enjoyable book, When Books Went to War, Molly Guptill Manning describes the Nazi efforts to destroy ideas. But those wicked efforts spurred the American public and publishers to promote books. At first, the effort was toward collecting donations. This provided only minimal reading material, much of which was of little interest to soldiers. The solution–a combination of book publishers and the department of war cooperating–was a publishing venture that resulted in American Service Editions of books. One has to remember that when the United States entered World War II, paperback books were not common. The need was for lots of books that were easily manageable by military men who could be anywhere from a ship to a barracks to a trench. Books were then printed in bulk, printed on cheap paper, and sent to the troops. Soldiers passed the books from around, and many books quickly fell apart after a combination of repeated readings and battlefield conditions. One of the most popular books among the soldiers was A Tree Grows in Brooklyn by Betty Smith, which was published in 1943. That book, along with others, reminded soldiers of home. Soldiers often wrote to authors such as Betty Smith and told how the books had helped them. Other books, especially as the end of the war drew closer, were focused on career options and fields of study. An unexpected result of the ASE books was that they became a prepartory school for soldiers. Many soldiers had read very little before the war. The long periods of boredom and isolation created readers. The books fed the need and created readers and thinkers. When the GI Bill was passed soon after World War II, the men who read novels in the trenches flocked to the college classrooms and became a generation of professionals and innovators. I was surprised at the amount of information that Ms. Manning uncovered for this book. The story is a rich one. There are many letters written by soldiers about the impact of the books. In some cases, there were debates and discussions about what books were deemed proper and politically neutral. Republicans were sometimes worried about any books that might promote President Roosevelt. Soldiers were, after all, a major voting bloc. There are two appendices in this book. One is a list of authors whose works were banned and burned by the Nazis. The other is a list of books that were published under the ASE program. By the end of the war, more books had been published and distributed to American troops than were burned by the Nazis. World War II was a battle of good versus evil. The Allies were not pure and virtuous people. Along with our joining forces with Stalin’s Soviet Union, we–both Americans and British–commited atrocities and took actions that were wrongful. But the American internment of Japanese citizens, while being wrong by our standards, doesn’t compare to Nazi furnaces and wicked sciences that were devoted to genocide. The burning of books does not equal killing of humans. But the books symbolized the evil heart of what we were fighting against. The publishing of books and distributing of them to our troops symbolize what our country stood for. There are lessons and ideas in this book for us today. Those lessons apply to the classroom and to our international policies. Most books fit pretty easily into one niche or another. This makes it easy for both individuals and librarians to place and, even more important, find the books when needed. (Women who shelf books by color are not in view here. That is a mental disorder.) But sometimes books come along that don’t easily fit into the categories on our shelves or in our minds. 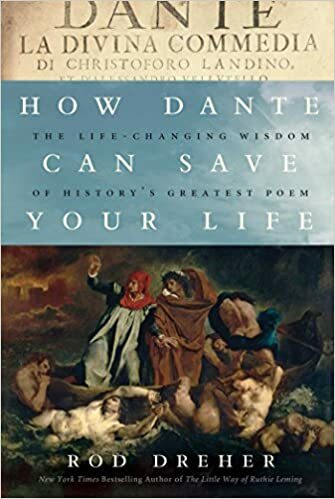 How Dante Can Save Your Life by Rod Dreher is one such book. It was the name of Dante, along with the subtitle referencing “history’s greatest poem” that drew me to this book. I was anxious to receive this book back in the spring and figured it would have a prominent place in my (I am embarrassed to admit) really small collection of Dante studies. When one thinks of Dante and his epic Divine Commedy, the first question is always translations. The Dante collector, assuming that he or she is not fluent in Italian, usually goes for some of the best known translations around. I first read Mark Musa’s translation of Dante, and the time through the work used Dorothy Sayers’ outstanding 3 volumes. Ms. Sayers’ learned Italian after reading Dante in the bombshelters of England during World War II. She surmised that this poem would be helpful to the Brits in the post-war years. Her translation is built around rhyming with less accuracy regarding sticking to the original text. This is why some of the other translations are helpful. One other outstanding translation, which could easily be my favorite, is John Ciardi’s. I have, but have not read Henry Wadsworth Longfellow’s translation. Primarily known for his now too often discredited poetry, Longfellow was classically trained and was a brilliant scholar as well as a gifted poet. Commentaries on Dante abound. Any teacher would be embarassed, shamed, and hopefully ostracized if he did not have Charles Williams’ The Figure of Beatrice. Peter Leithart’s Ascent to Love: A Guide to Dante’s Divine Comedy. All that being said, I have just about exhuasted my survey of personally owned and used Dante studies. Rod Dreher announces in the beginning of the book that his book is not a guide or commentary on Dante. Rather, the book is, as the title and subtitle note, a self-help book. And yet, it is also an autobiographical story. And, it is the story of the trials and tribulations of Christians. Also, it deals with stresses of life compounded by illness. Along with all this, it is a southerner’s story. While things that happen to southerners are not totally unique, they are recurrent among those of us who live in the south. Dreher stumbled upon a copy of Dante’s Divine Comedy, and on a whim, or what we Calvinists would insist is providence, he picked up the book and started reading. The beginning of Inferno, which is the first book in the trilogy, starts with a middle age man who is lost in the woods. While I am convinced of the value of teaching this book to high school students, Dante’s epic, like those of Homer, Virgil, and Milton, grow with the age and maturity of the reader. Almost anyone middle aged (whatever age that is) has exprienced the “lost in the woods” syndrome of life. For Dreher, several struggles converged to wreck his life. He became physically very ill soon after moving back to his boyhood hometown in south Louisiana. His sister and only sibling, Ruthie Leming, had died of cancer a short time before. Dreher and his wife felt the need to be close to his parents and his sister’s children. This ideal move to a small town in the south proved to be anything but ideal. Dreher crashed. All of his life, he had a love/hate relationship with his father. The older Mr. Dreher was a good man in southern, small town, family, and Christian terms. But he and Rod were very different. Like many southerners, Mr. Dreher loved hunting and other features of southern life. Rod loved books, had been a rebel of sorts in his earlier years, and had traveled and stretched his horizons far beyond his roots. God used Dante’s epic poem, a strong Orthodox priest, and a solid Baptist counselor to help Dreher through all his struggles. As with most of us, other people are a problem, have caused us problems, and refuse to change. But the journey Dante opened up to Dreher was not dealing with his family and others. It centered on the one person who Dreher had to get to know, understand, and change–himself. Martin Luther taught that the Christian life is one of ongoing, continual repentance. It is painful. Like Dante’s journey, it begins in Hell, not Heaven. But whether one discovers and begins this journey with Dante, John Bunyan, C. S. Lewis, or some other source, it is a journey worth the pain and struggle. Rod Dreher has a blog, located HERE. I am only vaguely aware of other issues, political and theological, that he had discussed and written about. My only concern here is with this book. It was very moving and helpful. I recommend it to students of literature and of the human soul. The Battle of Gettysburg is often marked as the turning point of the Civil War. The high losses in Lee’s Army of Northern Virginia both in terms of soldiers and commanders left him with few tactical choices other than fighting defensively for the rest of the war. Occurring in July of 1863, the battle was positioned roughly halfway through the war. The idea of a turning point, however, is an interpretive tool of historians. Determining a historical turning point involves looking back after all the events are completed. Had Lincoln been defeated at the polls and had the Confederates effectively defended Atlanta, late 1864 could have been a turning point in the war. No one knows what the results would have been if General George B. McClellan had been elected as the Democrat replacement for Lincoln. In the spring of 1865, had Lee led his men to the mountains and fought a guerrilla-style war for ten years after the fall of Richmond, historians might have talked about that as the turning point in the South’s successful War for Independence. Small details, minor actions, and slight mistakes often determine the course of history. Almost any battle is, at some point, a close call, a near miss, a result of the unexpected and unplanned event, and the result of luck, fortune, or providence, depending upon who is writing the account. The “what if’s” of history entertain the thoughts of history students and the passions of history’s partisans.